Laborec is mentioned in the very start of the chapter: the battalion was to march from here to the front via Eastern Galicia. They will eventually arrive by the Laborec without the river being mentioned explicitely any more. Humenné is the largest city along the river, but mentioned later are also Brestov nad Laborcom, Radvaň nad Laborcom, Čabiny, and Medzilaborce. Laborec is a river in Eastern Slovakia, then part of Hungary. During the winter of 1914/15 the russians pushed forward down the Laborec valley, which is evident from passages later on in the novel. [3.3] Po celou dobu železniční přepravy batalionu, který měl sklízet válečnou slávu, až projde pěšky od Laborce východní Haličí na front, vedly se ve vagonu, kde byl jednoroční dobrovolník a Švejk, opět podivné řeči, víceméně velezrádného obsahu; v menším měřítku, ale můžeme říct povšechně, dělo se tak i v jiných vagonech, ba i ve štábním vagonu panovala jakási nespokojenost, poněvadž ve Füzesabony přišel rozkaz po armádě od pluku, ve kterém se porce vína snižovala důstojníkům o jednu osminku litru. Füzesabony is a place where the battalion stopped as it was discovered that a company had left their field kitchen behind in Bruck. Further bad news was that the wine portion for the officers and the sago ration for the men had been reduced. They thought they were finally having goulash and potatoes served, but were to discover that the whole goulash-story was just training for the front as they had to get used to suddenly give up meals. Füzesabony is a minor town in the Heves-province of Nortern Hungary, most notable as a railway junction. [3.3] Ve Füzesabony přišlo se také na to, že jedna kumpanie ztratila polní kuchyni, poněvadž konečně se měl na této stanici vařit guláš s bramborama, na který kladl velký důraz „latrinengenerál“. Pátráním vyšlo najevo, že nešťastná polní kuchyně vůbec s sebou z Brucku nejela a že asi dodnes tam stojí za barákem 186, opuštěná a vychladlá. Miskolc was worth a short stop to finally get the goulash but this was impossible as the tracks were blocked by Russian railway carriages. Miskolc is a city in north eastern Hungary, and with 180,000 inhabitants the third largest in the country after Budapest and Debrecen. Miskolc was hit hard by a cholera epidemic during WW1. [3.3] Tohle byla tedy jakási průprava, ne tak do důsledků tragická, ale přece jen poučná. Když totiž se měl již guláš rozdávat, přišel rozkaz „Do vagonů!“ a už se jelo na Miškovec. Ani tam se nerozdal guláš, poněvadž na trati stál vlak s ruskými vagony, proto se mužstvo nepustilo ven z vagonů a ponechalo se mužstvu volné pole k fantasii, že se bude guláš rozdávat, až se vyleze už v Haliči z vlaku, kde bude uznán guláš zkysaným, k požívání neschopným, a pak že se vyleje. Tiszalúc is a place the train just passes, no goulash here either. Tiszalúc is a town in north eastern Hungary by the river Tisza. It is on the railway line between Miskolc and Sátoraljaújhely. Tiszalök as Hašek wrote, is also a place, but this is surely a mistake as it is not on the railway line. [3.3] Potom vezli guláš dál na Tiszalök, Zombor, a když už nikdo nečekal, že se bude guláš rozdávat, zastavil se vlak v Novém Městě pod Šiatorem, kde se znova rozdělal oheň pod kotli, guláš se ohřál a byl konečně rozdán. Mezőzombor is a place the train just passes, no goulash here either. Mezőzombor is a town in north eastern Hungary on the railway line between Miskolc and Sátoraljaújhely. The author calls it Zombor. Sátoraljaújhely sees a short stay by the march battalion as the goulash and potatoes are finally distributed. The stay in Sátoraljaújhely starts with a description of how Hungarian Honvéd-Hussars abuse a group of Polish Jews. Then another conflict erupts between Švejk and Dub: the foolish reserve lieutenant claims that destroyed weaponry is Russian even though it clearly has inscriptions identifying it as Austrian. Then Švejk pulls an incredibly long anecdote for Lukáš to the effect that the obrlajtnant makes the following comment: "I’m coming to the conviction that you don’t respect your superiors at all". Finally there is an episode that illustrates the linguistic diversity of the multi-ethnic empire: a Polish soldier creates confusion because he is unable to understand and reproduce the password. Sátoraljaújhely is a town in the north-eastern corner of Hungary, right on the border with Slovakia. The Trianon-treaty of 1920 split the town between Hungary and Czechoslovakia. At the railway station there is a memorial plaque to Svejk. The suburb Kisújhely with the other important railway station is part of Slovakia and is now called Slovenské Nové Mesto. Maps from 1910 reveal that there was only one railway station in the town. Thus it can with near certainty be concluded that the plot took place on current Hungarian territory. [3.3] Potom vezli guláš dál na Tiszalök, Zombor, a když už nikdo nečekal, že se bude guláš rozdávat, zastavil se vlak v Novém Městě pod Šiatorem, kde se znova rozdělal oheň pod kotli, guláš se ohřál a byl konečně rozdán. tanice byla přeplněna, měly být napřed odeslány dva vlaky s municí, za nimi dva ešalony dělostřelectva a vlak s pontonovými oddíly. Vůbec možno říct, že zde se shromáždily vlaky s trupami všech možných částí armády. Na Poříčí is mentioned in the anecdote about Colonel Fliedler von Bumerang. Na Poříčí is a street in Nové Město, Prague, starting by Prašná brána and ending by Florenc. [3.3] Tak jak šli přes Poříč, kolem Rozvařilů, Železný skočil do průjezdu a ztratil se mu průchodem a zkazil Kaučukovýmu dědkovi tu velikou radost, až ho bude sázet do arestu. Dolní Královice is mentioned in the anecdote about Colonel Fliedler von Bumerang, in the part where Švejk virtually declare him a saint. He let his soldiers drink empty the brewery in Dolní Královice. Dolní Královice is a village in the eastern part of the Benešov district, not far from Lipnice nad Sázavou. The village was moved in the seventies because a water-reservoir for Prague was built in the Želivka valley. The brewery was closed in 1957. During the summer of 1922 Jaroslav Hašek visited the village. This was his last major excursion before his untimely death six months later . Kołomyja was the home town of a Pole who did't grasp the field password due to linguistic mix-ups. This incident happended during the stay Sátoraljaújhely. Kołomyja is the Polish name of Коломия (Kolomyja) in Galicia, now in the Ivano-Frankivsk oblast in the Ukraine. Until 1918 it belonged to Austria, like the rest of the region. The Russians occupied the city in september 1914, but were driven out the year after. At the time almost half the population were Jewish. [3.3] Ten den byl feldruf: „Kappe“ a losung: „Hatvan“. Post, který si to měl u telefonních aparátů pamatovat, byl nějaký Polák z Kolomyje, který nějakou divnou náhodou se dostal k 91. regimentu. Lastovce is passed through by the battalion on the way from Sátoraljaújhely to Trebišov. This happened after midnight and there is no description of any stay here. Lastovce is almost certainly what the author had in mind with Ladovce. It is a small place just south of Trebišov in the far east of Slovakia. The region was part of Hungary until 1920. [3.3] Po půlnoci vlak se hnul na Ladovce a Trebišov, kde ho ráno uvítal na stanici veteránský spolek, poněvadž si tenhle maršbatalion spletl s maršbatalionem 14. honvédského maďarského pluku, který projel stanicí hned v noci. Trebišov railway station in 2004. 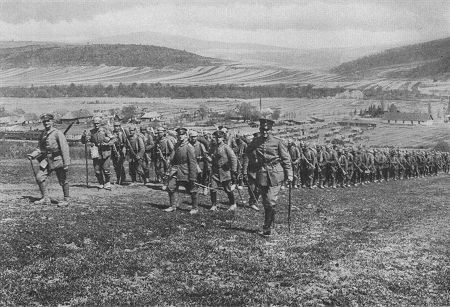 Trebišov is passed through by the march battalion on the way from Sátoraljaújhely to Humenné. This happened early in the morning and the soldiers on the train were woken up by members of a Hungarian veterans association who thought they were greeting a march battalion of the 14th Honvéd-regiment. The stay at the station lasted only five minutes. Trebišov is a town in the Zemplín region of Eastern Slovakia. The area was in 1915 still ruled by Hungary. Tisza and the Tisza Valley is mentioned when the author describes the first signs of war damage as the train moves north towards Humenné. This journey was along the river Laborec, a tributiary to Tisza. Tisza is a river flowing from the Ukrainian Carpathinas and enters the Danube in the Vojvodina region of Serbia. Cities and towns along the river include Sighetu Marmaţiei, Čop, Tokaj, Szolnok and Szeged. [3.3] Za pět minut jel vlak dál na Humenné. Zde již byly jasně a zřetelně znát stopy bojů, když Rusové táhli do údolí Tisy. Po stráních táhly se primitivní zákopy, tu a tam bylo vidět vypálenou usedlost, kolem které narychlo zbudovaná bouda znamenala, že se majitelé opět vrátili. Humenné was the scene of an eventful lunch-break which must have lasted a couple of hours. The train arrived around noon, two days after the departure from Budapest, thus the date is 26 May 1915. The author notes that the station area is damaged by fighting. There is a grim episode when the arriving troops observe how Hungarian gendarmes mistreat members of the Ruthenian population (called Hungarian Russians by the author). This is generally condemned by the officers, except for the despicable lieutenant Dub who reacts approvingly. This episode leads directly to Lukáš wanting to get drunk to forget his Weltschmerz. We know how it all ended; Švejk gets caught by Dub when buying booze from a local Jew and has to drink the whole bottle in one go to protect himself and his superior. He narrowly gets away with, and all in all the stay here was troublesome for Dub. He suffers further humiliation when a Hungarian soldier recognizes him as Czech and mockingly holds his hands in the air (alluding to the Czechs alleged lack of willingness to fight). Humenné is a town of the Laborec Valley in eastern Slovakia with around 35,000 inhabitants. There is a statue of Švejk at Humenné station, the first ever in the world. Humenné was until 1921 still Hungarian and Russian forces briefly occupied the town at the end of November 1914. The population was ethnically mixed with Hungarians as the largest group. In den Karpathen wurden die auf Homonna vorgedrungenen Kräfte geschlagen und zurückgedrängt. Unsere Truppen machten 1500 Gefangene. [3.3] Za pět minut jel vlak dál na Humenné. Zde již byly jasně a zřetelně znát stopy bojů, když Rusové táhli do údolí Tisy. Po stráních táhly se primitivní zákopy, tu a tam bylo vidět vypálenou usedlost, kolem které narychlo zbudovaná bouda znamenala, že se majitelé opět vrátili. Potom, když k polednímu přišla stanice Humenné, kde nádraží jevilo také zbytky bojů, vykonány byly přípravy k obědu a mužstvo transportu zatím mohlo nahlédnout do veřejného tajemství, jak úřady po odchodu Rusů jednají s místním obyvatelstvem, které bylo řečí i náboženstvím příbuzné ruským vojskům. Strašnice is mentioned in the anecdote about the gardener Josef Kalenda who from here sets out on his legendary pub crawl across Prague. Strašnice is an area of eastern Prague, bordering Královské Vinohrady, Žižkov, Vršovice, Zaběhlice and Michle. The former town became part of the capital in 1922. [3.3] Nedal se však tím odstrašit, poněvadž se vsadil předtím ten večer v Strašnicích v hospodě ,U remisy’ s jedním řídičem vod elektriky, že udělá pěšky cestu kolem světa za tři neděle. Počal se tedy dál a dál vzdalovat vod svýho domova, až se přivalil do ,Černýho pivovaru’ na Karlově náměstí, a vodtamtuď šel na Malou Stranu k Sv. Tomáši do pivovaru a odtamtud přes restauraci ,U Montágů’ a ještě vejš přes hospodu ,U krále brabanskýho’, pak na ,Krásnou vyhlídku’, odtud do Strahovskýho kláštera do pivovaru. Korunní třída was the street where Josef Kalenda started to get home-sick on his journey around the world, after having visited several hospody along the street. Korunní třída is a long street in Královské Vinohrady, leading from Strašnice to Náměstí Míru. Vinohradská vodárna (water tower) is located in this street. At the end of the street, at Náměstí Míru, Kostel svaté Ludmily, also mentioned in the anecdote, can be found. This is where Jaroslav Hašek married Jarmila Mayerova on May 23 1910. [3.3] Strašnickej zahradník, nějakej Josef Kalenda, ten se taky jednou vzdálil z domova, šel ze Strašnic na Vinohrady, stavil se ,Na zastávce’ v hospodě, ale to mu ještě nic nebylo, ale jakmile přišel do Korunní třídy k vodárně, bral v Korunní třídě až za kostel svaté Ludmily hospodu za hospodou a cítil už malátnost. Loretánské náměstí was the final stop on the odyssey of Josef Kalenda. He broke down on the pavement due to homesickness, coughed and spat on his world tour. Loretánské náměstí is a square at Hradčany, right by the Loreta Church and the Černín palace. The latter is used by the Ministry of Foregn Affairs. Loretánské náměstí is very close to the garrison prison where Švejk was detained when Katz "discovered" him. Kamýk nad Vltavou is mentioned when Švejk tells Dub that the cognac he illicitely bought for Lukáš is water rich in iron, just like the blacksmith in Kámyk got after throwing a horse-shoe in the well. Kamýk nad Vltavou is a place by the Vltava south of Prague. It is situated in okres Příbram. Don is mentioned by Marek when he sists in the staff carriage at Humenné station and invents the battalions history, where the Don-regiment is involved. Meanwhile Švejk is sleeping off the effect of the bottle of cognac. Don is one of the major rivers of Russia. It rises in the town of Novomoskovsk 60 kilometres southeast from Tula, southeast of Moscow, and flows for a distance of about 1,950 kilometres to the Sea of Azov. From its source, the river first flows southeast to Voronezh, then southwest to its mouth. The main city on the river is Rostov-na-Donu, and the main tributary is Donets. [3.3] Ku př. zde líčím, jak náš batalion, to snad bude asi za dva měsíce, málem překročí ruské hranice, velice silně obsazené, řekněme donskými pluky nepřítele, zatímco několik nepřátelských divisí obchází naše posice. Wallsee is mentioned by Marek when he writes about the Imperial family party at Schönbrunn. Marie Valerie travels to Schönbrunn for the single purpose of taking part in the celebration of Marek's heroic battalion. Wallsee was from 1895 the home Marie Valerie and her family. The castle is located by the Danube in the Amstetten district of Upper Austria. [3.3] Představuji si to tak, jak vidíte v mých poznámkách, že arcivévodská rodina Marie Valérie přesídlí kvůli tomu z Wallsee do Schönbrunnu. Padua is mentioned by Marek when he prepares a heroic death for Chodounský and Jurajda in his pre-written history of the battalion. See Karl von Österreich-Teschen. Padua is a major city in the Veneto region of Italy. It is situated between Verona, Vicenza and Venice. Like the rest of Veneto, Padua belonged to Austria between 1815 and 1866. [3.3] Mohu vám přečíst výňatek z armádního rozkazu, který bude čten po všech oddílech armády, který se velice podobá onomu rozkazu arcivévody Karla, když stál se svým vojskem roku 1805 před Paduou a den po rozkazu dostal slušný nátěr. Jindřichův Hradec is mentioned when Švejk talks in his sleep, still strongly hit by the bottle of cognac he had to gulp down. In this dream an unidentified self-killer from this town resembled Piskora, Lejhanz and Jaroš. The town also features in one of Švejk's final anecdotes, about the sausage-maker Josef Linek who puts insect powder in his sausages. Jindřichův Hradec is a town in South Bohemia situated in a flat aera with many fish ponds. The historical centre is protected as heritage. The town was also the seat of recruitment district No. 75 and the replacement battalion of Infanterieregiment Nr. 75. The regiment staff was also located here in periods and the regiment was always present with at least one regular battalion. Veszprém is mentioned in Švejk's excuse for not having woken up when Dub dropped by the carriage last time. Veszprém is a Hungarian city situated north of Lake Balaton. It is one of the oldest cities of Hungary and one of the first to get a university. Veszprém was in 1914 a garrison town, and was home to the 31st Honvéd Infantry Regiment. [3.3] „Já jsem, poslušně hlásím, pane lajtnant, celou noc nespal, poněvadž jsem si vzpomínal na ty doby, když jsme ještě dělali manévry u Vesprimu. Tenkrát suponovanej první a druhej armádní sbor šel přes Štyrsko a západníma Uhrama vobklíčil náš čtvrtej sbor, kterej byl na lágru ve Vídni a v okolí, kde jsme měli všude festunky, ale voni vobešli nás a dostali se až na most, kterej dělali pionýři z pravýho břehu Dunaje. Michalovce is a place the train must have passed already as it is commented before Medzilaborce that the Germans from Kašperské Hory were still singing, but that their enthusiasmn had vained after they had seen the war cemeteries and the torn pieces of uniform in the devastated Laborec Valley. Michalovce is, to judge by plot, itinerary and timing, surely what the author thinks of when he writes Milovice. The nearest Milovice is a place near Nymburk which had a Soviet military base from 1968 to 1991. In 1914 more than half the population of Michalovce were Hungarians and the author has probably translated the name from old maps which still used Hungarian names. [3.3] Němci od Kašperských Hor, kteří seděli v zadních vagonech a ještě v Milovicích na stanici hulákali při vjezdu: „Wann ich kumm, wann ich wieda kumm...“, od Humenného silně ztichli, poněvadž nahlíželi, že mnozí z těch, jejichž čepice jsou na hrobech, zpívali totéž o tom, jak to bude pěkné, až se opět vrátí a zůstane pořád doma se svou milou. Brestov nad Laborcom is mentioned by the narrator as the train moves on from Humenné towards Medzilaborce. The village has been burnt down during earlier fighting. Brestov nad Laborcom is a village by the river Laborec in Slovakia. The population count is just 66, 49 of them Ruthenians. It is situated two km south of Radvaň nad Laborcom. When Jaroslav Hašek wrote the novel, the name of the village was Zbudský Brestov. [3.3] Za čtvrt hodiny se jelo dál na Novou Čabynu přes vypálené vesnice Brestov a Veliký Radvaň. Bylo vidět, že zde to již šlo do tuhého. Karpatské stráně a svahy byly rozryty zákopy jdoucími z údolí do údolí podél trati s novými pražci, po obou stranách veliké jámy od granátů. Někde přes potoky tekoucí do Laborce, jehož horní tok dráha sledovala, bylo vidět nové mosty a ohořelé trámy starých mostových přechodů. Radvaň nad Laborcom is mentioned by the narrator as the train moves on from Humenné towards Medzilaborce. The village has been burnt down during earlier fighting. The village had already been mentioned in Budapest by Bautanzel as he related his experiences at the front in the Carpathians. Radvaň nad Laborcom is a village between Humenné and Medzilaborce by the Laborec river. From 1920 to 1964 the place were two separate villages, called Vyšná Radvaň and Nižná Radvaň. By Veliký Radvaň Hašek presumably meant the former which was on the railway line. On the military survey map from 1910 the Hungarian name Laborcradvány shown. Čabiny is mentioned by the narrator as the train moves on from Humenné towards Medzilaborce. The village has been burnt down during earlier fighting. Čabiny is a village in the Laborec valley between Humenné and Medzilaborce. The place was destroyed during the Russian winter offensive in 1914-15. The village is quite spread out and there are two railway stations: Nišné Čabiny and Vyšné Čabiny. These were separate communities until 1964. Medzilaborce witnesses a short stay by the march battalion. The main part is a description on how the army went about billetting from the local population. A farmers family had to let go of three pigs but they had few alternatives. The destruction wreaked on the town by recent fighting is described in some detail. Medzilaborce is a town in the Laborec valley of Eastern Slovakia, near the Polish border and the Łupków Pass. In February 1915 Russian troops occupied the town but were driven out in May. This happended only a few weeks before Švejk and his march batallion arrived, so the traces of fighting described in the novel were very fresh. [3.3] V Medzilaborci byla zastávka za rozbitým, vypáleným nádražím, z jehož začouzených stěn vyčnívaly zkroucené traversy. Nový dlouhý barák ze dřeva, namísto vypáleného nádraží rychle postavený, byl pokryt nalepenými plakáty ve všech řečích: „Upisujte rakouskou válečnou půjčku!“ V jiném dlouhém baráku byla i stanice Červeného kříže, odkud vyšly s tlustým vojenským lékařem dvě sestřičky a smály se na celé kolo tlustému vojenskému lékaři, který k jich obveselení napodoboval různé zvířecí zvuky a nepodařeně chrochtal. Dolní Zahájí is mentioned by Baloun as he admits to his sins, one of them being that he battered the chaplain here. Dolní Zahájí can not be identified from a modern map but Baloun is probably talking about Zahájí by Mydlovary in South Bohemia, the district he is from. [3.3] Baloun s naprostým zoufalstvím začal vyznávat generální zpověď: „Já jsem se vám rouhal svatejm i světicím božím, na Malši v hospodě a v Dolním Zahájí ztřískal jsem kaplana. V boha jsem ještě věřil, to nezapírám, ale o svatým Josefovi jsem pochyboval. Palota is mentioned in passing when it's said that the troops are having lunch in the Przełęcz Łupkowska beyond Palota. Palota is a village on the Slovak side of the Łupków Pass, about 10 km north of Medzilaborce. There is no railway station any more, although the railway line from Medzilaborce to Sanok goes through the village. [3.3] Mužstvu bylo oznámeno, že oběd bude za Palotou v Lupkovském průsmyku, a také vyšli do obce Medzilaborce batalionní účetní šikovatel s kuchaři od kumpanií a poručíkem Cajthamlem, který měl na starosti hospodářství batalionu. K nim byli přiděleni čtyři mužové jako patrola. In 2010: the building is Łupków station. Łupków Pass is mentioned in passing when it's said that the troops are having lunch in the Przełęcz Łupkowska beyond Palota but it is unknown exactly where in the pass this meal took place. The author mentions a memorial which the German Brandenburg regiment had set up in memory of their fallen heroes on a rcok behind the station. Otherwise, the grotesque way food is distributed is revealingly described. Officers of course get most, then the distribution is on the discretion of the cooks who carefully dish out to those they believe they need to be on good terms with. The only person who openly reacts against this practice is Marek. Otherwise Švejk has another clash with Dub, ending with the Lieutenant pulling his revolver. Finally there is an episode where Švejk reports Dub for having hit Kunert. Here Lukáš observes a hitherto unknown side to his officers' servant, far from the affable person he has got accustomed to. Łupków Pass is a mountain pass in the Carpathians between Slovakia and Poland. The tunnel and the associated railway line were finished in 1874, to link Galicia with the rest of the Austro-Hungarian Empire across the mountains. The pass was one of the strategically important Carpathian passes bitterly contested in battles during the winter of 1914/1915. The railway tunnel was demolished and rebuilt multiple times during both World Wars. [3.3] Hejtman Ságner dal již též rozkaz týkající se důstojnické kuchyně: „Vepřové na kmíně; vybrat to nejlepší maso, aby to nebylo příliš tučné!“ A tak se stalo, že když v Lupkovském průsmyku rozdávala se mužstvu menáž, v každém vojenském kotlíku ve své porci polévky našel jednotlivec dva malé kousíčky masa, a ten, který se narodil ještě na horší planetě, našel jenom kousek kůže. Brandenburg as part of Prussia. Brandenburg enters through the name of a military unit who have erected a monument to their fallen behind the station in the Łupków Pass. Brandenburg is a historic province in Prussia that existed until 1945. It does not correspond to the current German state, as it included areas in current Poland. The capital was Potsdam. The "Brandenburgers" that are referred to in the novel is probably Dragoner-Regiment „von Arnim“ (2. Brandenburgisches Nr. 12), that belonged to the 4th German Infantry Division, part of the Beskidenkorps. This unit fought in the Laborec-valley from April 1915 and pursued the Russians across Východní Beskydy in early May 1915. [3.3] Za nádražím na skále pospíšili si již Němci z říše postavit pomník padlým Brandeburákům s nápisem: „Den Helden von Lupkapaß“, s velikou říšskoněmeckou orlicí vylitou z bronzu, přičemž na podstavci bylo výslovně podotčeno, že ten znak je vyroben z ruských děl ukořistěných při osvobození Karpat říšskoněmeckými pluky. Csap is mentioned in a confused telegram from brigade staff indicating that the company were to move east towards the front already from Sátoraljaújhely. Csap is the Hungarian name of border town Чоп (Chop) between Ukraine, Slovakia and Hungary, until 1921 part of Hungary. It is now located on Ukrainian territory and is an important railway junction and border crossing. [3.3] Zprávy byly tak nejasné, že to vypadalo asi tak, že by ani neměli do Lupkovského průsmyku přijeti a měli jeti zcela jiným směrem od Nového Města pod Šiatorem, poněvadž v telegramech byla nějaká řeč o místech: Csap - Ungvár, Kis-Berezna - Uzsok. Ungvár is mentioned in a confused telegram from brigade staff indicating that the regiment were meant to move east to the front already at Sátoraljaújhely. Ungvár is the Hungarian name of Ужгород (Uzhhorod), a city now on the border between Ukraine and Slovakia. Until 1921 it was part of Hungary, and until 1938 it belonged to Czechoslovakia. It located just inside Ukrainian territory and is an important railway junction. The city has a university and some industry. It is also a quite popular tourist destination. The city sports a bronze miniature statue of Švejk, mounted on the railings by the river. Kisberezna is mentioned in a confused telegram from brigade staff indicating that the regiment were to move east already at Sátoraljaújhely. Kisberezna is the Hungarian name of Малий Березний (Malyj Bereznyj), a village on the western side of Carpathians north of Užhorod. Until 1921 it was Hungarian, in the inter-war years it belonged to Czechoslovakia, from 1945 the Soviet Union and from 1991 Ukraine. In 1914 more than 70 per cent of the population were Rusyns. Uszok is mentioned in a confused telegram from brigade staff indicating that the march batallion were to move east already at Sátoraljaújhely. Uszok (now Užok/Ужok) is a village in Ukraine, near the source of the river Už. It is best known through the mountain pass which it has given its name to. There was heavy fighting in the Uszok pass in 1914-15. From early May 1915 the pass was finally on Austro-Hungarian hands. Munkács is mentioned in a confused telegram from brigade staff indicating that the march batallion were to move east already at Sátoraljaújhely. Munkács is the Hungarian name of Мукачеве, a city in the Ukrainian Carpathians. One of the three railwat tracks across the Carpathians passed the city, and it was also home of a Honvéd garrison. After 1921 it was called Mukačevo and was part of Czechoslovakia. From 1945 to 1991 it was on Soviet hands. [3.3] Mamlas v brigádní bási je udiven odpovědí, že jde o 7. pochodový prapor 91. pluku, i táže se, kdo dal rozkaz jeti na Munkačevo, po vojenské trati na Stryj, když maršruta je přes Lupkovský průsmyk na Sanok do Haliče. Stryj is mentioned in a confused telegram from brigade staff indicating that the march batallion were to move east already at Sátoraljaújhely. Stryj (Стрий) is a city in oblast Lviv of Ukraine, and is also the name of the river flowing through the town. The city belonged to Galicia in 1914. Velká Polanka is mentioned by Lieutenant Dub when he pretends to be an expert on military strategy. 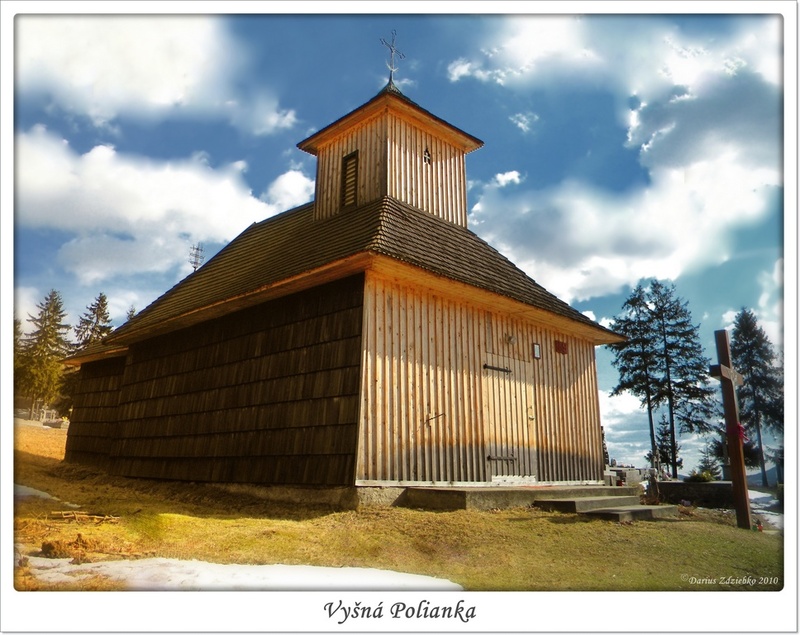 Velká Polanka is not one hundred per cent identfied, but by analyzing the text and historical events we can conclude that the place in question is Vyšná Polianka north of Bardejov. Until 2 May 1915, when the Central Powers started their offensive by Gorlice and Tarnów, the front went very close to the village. The Russian 48th Infantry Division (HQ in Samara) held this section of the front at the time. The division was almost completely destroyed during the first week of May. Samara is mentioned by lieutenant Dub when he pretends to be an expert on military strategy lecturing on how the Samara-division was destroyed. Samara is a city on the Volga river and is the sixth largest city in Russia. Samara is an important industrial city, known amongst other things for its arms industry. The city was provisional capital of the Soviet Union during WW2. From 1935 to 1991 it was called Kuybyshev. The Samara Division that Dub talks about is the Russian 48th Infantry Division (HQ in Samara) which during the first week of May 1915 were trapped and destroyed in the Carpathians. Large parts of it, including staff and its commander Lavr Kornilov were taken prisoners. The narrative in the novel corresponds exactly with historical facts. Jaroslav Hašek stayed in Samara from early April 1918 until the city on 8 June was occupied by the Czech legions (see České legie). He was also there in 1915 and 1916 on the way to and from the prisoner's camp by Totskoye. Moreover he must have travelled through the city on his way back from Irkutsk in November 1920 after Comintern had called him back to act as an agitator in his homeland. In 2013 a statue of Švejk was erected in Samara, being the fourth of his kind in Russia. The others are found in St. Petersburg, Omsk and Bugulma. There is also a Švejk-restaurant in the city and on the former Hotel San Remo where Jaroslav Hašek had his office in 1918 there used to be a memorial plaque on the wall but this had in 2010 been removed. Bukowsko is mentioned by Lieutenant Dub when he pretends to be an expert on military strategy. Bukowsko is a village in the Sanok district of Poland, in 1914 part of Austria. Dynów is mentioned by Lieutenant Dub when he pretends to be an expert on military strategy. Dynów is a town in Rzeszów county in Poland, in 1914 part of Austria. Poděbrady is mentioned by Švejk in an anecdote about a chamberpot, as an apropos to the abandoned Russian chamberpot in the Łupków Pass. Poděbrady is a spa town in okres Nymburk. It is located 50 km east of Prague on the river plain by the Labe. Švejk's anecdote is yet another example of the author mixing real people into the story. This time it is Hájek who was also mentioned in Marek's tale from his time as editor of "Animal World". [3.3] Na všechny to působilo ohromným dojmem, a když poručík Dub mlčel, ozval se Švejk: „Poslušně hlásím, pane lajtnant, že s takovým nočníkem byla jednou pěkná legrace v lázních Poděbradech. Vo tom se u nás vypravovalo na Vinohradech v hospodě. Tenkrát totiž začali vydávat v Poděbradech časopejsek ,Nezávislost’ a poděbradskej lekárník byl toho hlavní hlavou, a redaktorem tam udělali ňákýho Ladislava Hájka Domažlickýho. Trento is mentioned bythe author in his discussion about the differing degrees of stupidity amongst civilian and military authorities. In [IV.3] is mentioned again in connection with the homosexual colonel Habermaier. 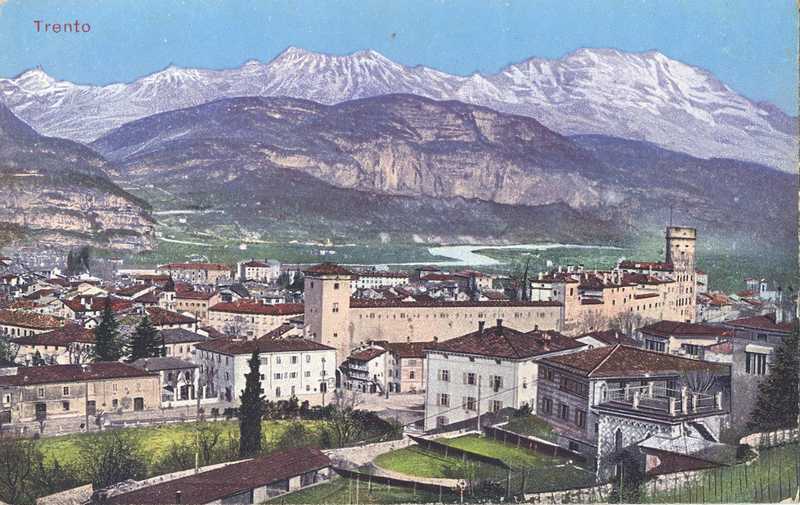 Trento (in 1914 also Trient) is a city in Northern Italy which in 1914 was still part of Austria. It was heavily fortified, had a garrison and became a scene of fighting from 1915 onwards. The first Švejk, the prototype Švejk, who Hašek wrote five short stories about in 1911, visisted Trento during manouvres. It must be added that this Švejk was a very different character from the one we know from the biting satirical novel. The comparison with Forrest Gump is more relevant. [3.3] U některých posádek, jako například v Tridentu, místo prďoch říkalo se „náš starej hajzl“. Ve všech případech šlo o osobu starší, a jestli Švejk nazval v duchu poručíka Duba poloprďochern, vystihl naprosto logicky, že jak do stáří, tak do hodnosti a vůbec do všeho schází poručíkovi Dubovi do prďocha ještě 50 procent. Bytouchov is mentioned in connection with the soldier Koudela. Bytouchov (now Bítouchov) is a village by Mladá Boleslav. Mnichovo Hradiště is mentioned in passing by Švejk in his conversation with Lukáš after the episode with Dub and Kunert. Mnichovo Hradiště is a town north of Mladá Boleslav. Szczawne is described by the author during the train trip from the Łupków Pass to Sanok. It is a tale of destruction, even more white crosses anmd a statue of Christ who has had his head blown off. Szczawne is a village in the Podkarpackie region of Poland, on the railway line between the Łupków Pass and Sanok. The railway station is Szczawne-Kulaszne. The area was until 1947 mainly populated by Ukrainians but these were forcibly resettled during the ethnic cleansing after WWII. [3.3] Za stanicí Ščavne počaly se objevovat opět v údolích nové vojenské hřbitůvky. Pod Ščavne bylo vidět z vlaku kamenný kříž s bezhlavým Kristem pánem, který ztratil hlavu při odstřelu trati. Kulaszne is described by the author during the train trip from the Łupków Pass to Sanok. He writes that a Red Cross train has been attacked and derailed. The cook Jurajda asks if things have gone that far that it is allowed to shoot at a Red Cross trian. Švejk philosophically retorts that there are many things that are not allowed that still can be done. Kulaszne is a village in Komańcza community in the Podkarpackie region of Poland, on the railway line between the Łupkow-passet and Sanok. The railway station is Szczawne-Kulaszne. The village was occupied by the Russian army from November 1914 to May 1915. At the time it was populated predominantly by Ukrainians with a Greek Catholic faith. These were expelled after WW2 but again (2010) the village has a Greek Catholic church. With near certainty the 12th march battalion of IR91 with Jaroslav Hašek passed this point on 2 July 1915. They had reached Humenné on that date and would presumably have travelled on very soon. We also know that they reached Sambor on 4 July. [3.3] Vlak zrychloval svou rychlost, žena se dolů údolím k Sanoku, obzory se rozšiřovaly a tím i četnějšírni stávaly se celé skupiny rozbitých vesnic po obou stranách do kraje. U Kulašné bylo vidět dole v říčce s železničního náspu zřícený, rozbitý vlak Červeného kříže. Málaga is mentioned by Jurajda when he tells about the nurses at the Red Cross in Bruck who embezzled chocolate and Málaga wine. Málaga is a city in Andalusia, Southern Spain. The Málaga wine is a sweet dessert wine which is produced in the region around the city. The wine type has a history that goes back to Roman times and is protected by designation of origin (Denominación de Origen). [3.3] „Hlavně se krade u Červeného kříže,“ s velkou zlostí prohlásil kuchař Jurajda. „Měl jsem v Brucku známého kuchaře, který vařil pro sestřičky v baráku, a ten mně říkal, jak představená těch sestřiček a vrchní ošetřovatelky posílají domů celé bedny malaga a čokolády. To nese sama sebou příležitost, to je sebeurčení člověka.